[S392] Website findagrave.com (http://www.findagrave.com/) "# 68995380." [S208] 1900 US Census, MAINE, PENOBSCOT, CORINNA. [S522] Gordon A. Morley and William J. Park, Mount Hermon Cemetery, H358. [S205] Newspaper, The Lancet, 9 July 1864, p. 56. [S57] A. Peterkin: 1660-1727 and William Johnston: 1727-1898, Medical Officers in the British Army, 3774. [S232] Ancestry.com, Quebec Vital and Church Records (Drouin Collection), 1621-1967. Québec (Anglican Cathedral Holy Trinity church), 1880. [S232] Ancestry.com, California Birth Index, 1905-1995. [S392] Website findagrave.com (http://www.findagrave.com/) "# 45852472." [S160] New York Times, 31 Oct 1937 p. 91. [S232] Ancestry.com, Quebec Vital and Church Records (Drouin Collection), 1621-1967. Québec (Anglican) (Québec (Saint Mathew`s Church)), 1900. [S523] 1861 Canada, Year: 1861; Census Place: Québec, Canada East; Roll: C-1256; Page: 13. [S522] Gordon A. Morley and William J. Park, Mount Hermon Cemetery, H359. [S145] John Edwards Griffith, Pedigrees, p. 277. 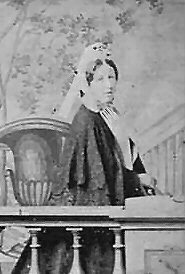 Angharad verch Griffith ap Madog was the daughter of Gruffudd ap Madog, Lord of Dinas Brân and Emma Audley.1 Angharad verch Griffith ap Madog married William le Botiler of Oversley and Wemme, son of Ralph le Botiler of Oversley and Maud Pantulf Baroness of Wem, after 2 October 1261.1 Angharad verch Griffith ap Madog died in 1308. [S135] George Edward Cokayne, Complete peerage, Vol. 2. p. 231. [S389] Thomas Nicholas, County Families of Wales, p. 42. [S189] Frederick A. Virkus, Abridged Compendium of American Genealogy, Vol. 1 p. 17. [S83] NEHGR, Vol. 108 p. 173. [S175] Frederick Lewis Weis, Ancestral Roots, p. 182. [S156] Douglas Richardson, Plantagenet Ancestry, p. 243. [S122] Frederick Lewis Weis, The Magna Charta Sureties, p. 138. [S15] Joseph Lemuel Chester, Westminster Registers, p. 131. note. 5. [S232] Ancestry.com, Maine, Marriage Records, 1713-1922. Lavinia W. Grimshaw was born on 7 December 1837 in Louisiana.2 She was the daughter of George Grimshaw and Rachel Graves.1 Lavinia W. Grimshaw married John L. Bates in Lockwood Parish, Louisiana.2 Lavinia W. Grimshaw died on 2 September 1892 in Marlin, Texas, at the age of 54. [S250] Saint Nicholas Society, Vol. 1. p 23. [S250] Saint Nicholas Society, Vol. 1. p 41.